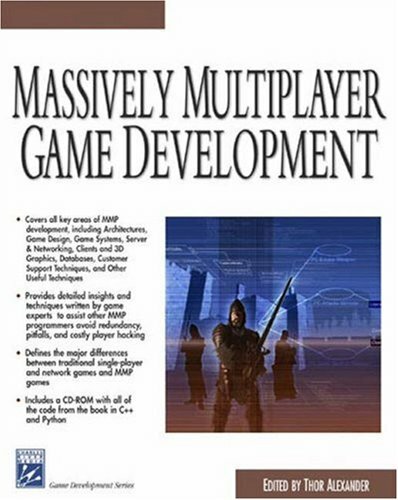 Massively Multiplayer (MMP) game development is one of the fastest growing areas in the game market. With the first MMP releases, the genre took off with amazing speed, and as its popularity continues to soar, so do the many challenges, internationalization, customer support, hacking, and technological advancements. To keep up with these challenges, developers need to implement the best tools and techniques available. Massively Multiplayer Game Development provides these solutions. This comprehensive, insightful collection of articles is written by some of the industry's best MMP developers, and provides a wealth of unique knowledge acquired while working in the MMP trenches. Details on database techniques and game systems are also included. Unlike many programming books, Massively Multiplayer Game Development is intended to appeal to the entire team: programmers will find a multitude of technical ideas, and designers and producers will benefit from the detailed information on design, architecture, and customer support.